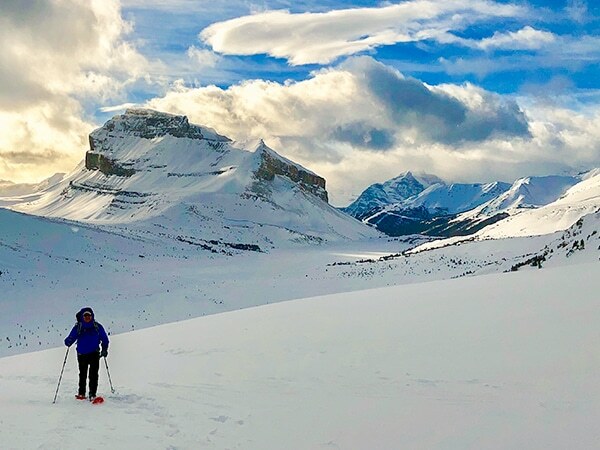 Snowshoeing in Banff National Park is incredible, and the popularity is rapidly increasing. The best snowshoes in Banff National Park cover a variety of trails that range from easy strolls to challenging, all-day trips. 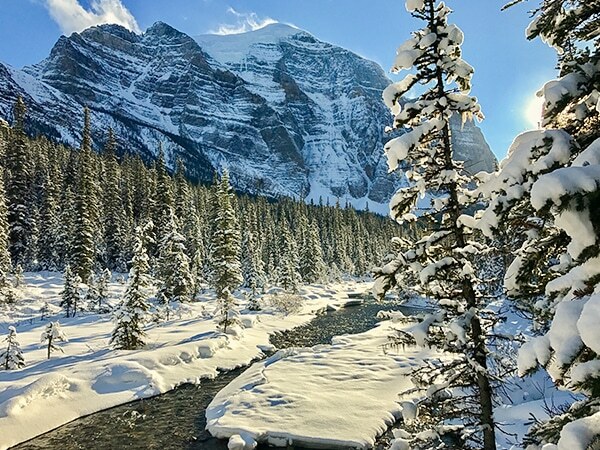 Snowshoeing in Banff opens a wonderland of frozen lakes and waterfalls and snow-covered forests that you have to see to believe. Some of the snowshoeing trails follow summer hiking trails that may be familiar to you. Here are the 10 best snowshoe trails in Banff National Park, several of which are suitable for the whole family. Healy Pass is one beautiful meadow after another in summer, however in winter it is simply epic views of snow-covered peaks. The trail that takes you to Healy Pass is often packed hard which makes the snowshoeing easier. This is the best snowshoe trail in Banff National Park for intermediate and advanced snowshoers. 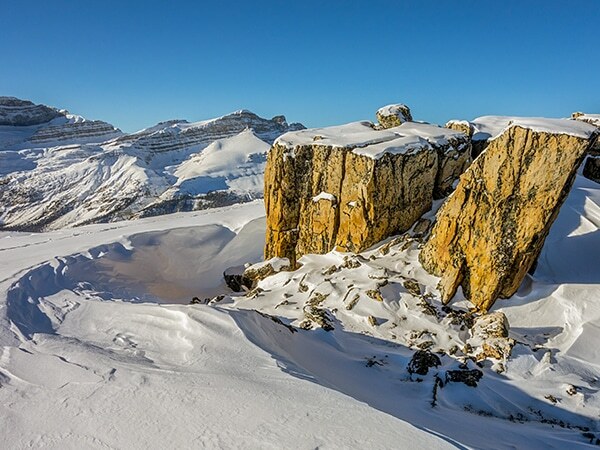 Wilcox Pass is a relatively easy snowshoe trail on the border of the Athabasca Icefield. You get to see some of the highest mountains in Alberta as well as several glaciers along the way. This snowshoe near Lake Louise takes you almost all the way to Skoki Lodge. If you can’t stay at Skoki Lodge, you can still enjoy the incredible scenery on the trail to Deception Pass. Starting from Lake Louise Ski Hill it is a long trail to Deception Pass, so it’s not suitable for beginners. This is a classic snowshoe trail in Banff National Park. Just outside the town of Banff, at Sunshine Ski Hill, is one of the best snowshoe trails for beginners. You’ll need to buy a lift ticket, but this Sunshine Meadows snowshoe has some of the best views in the Canadian Rockies. This is a great snowshoe trail for experienced snowshoers. 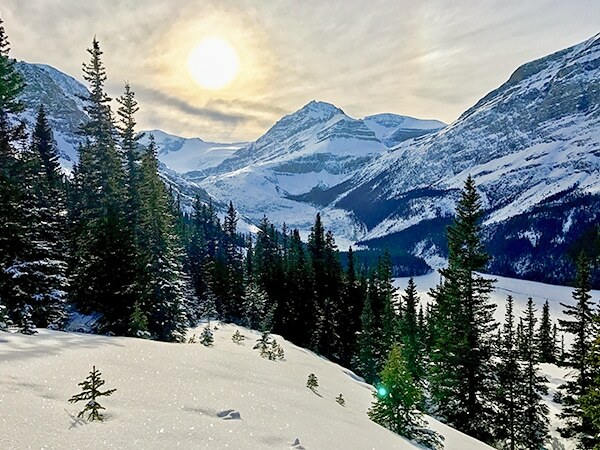 You can see some of the giant crystals and fascinating rock formations on this trip, as well as great views to the Wapta Icefield while snowshoeing on the trail to Crystal Ridge. 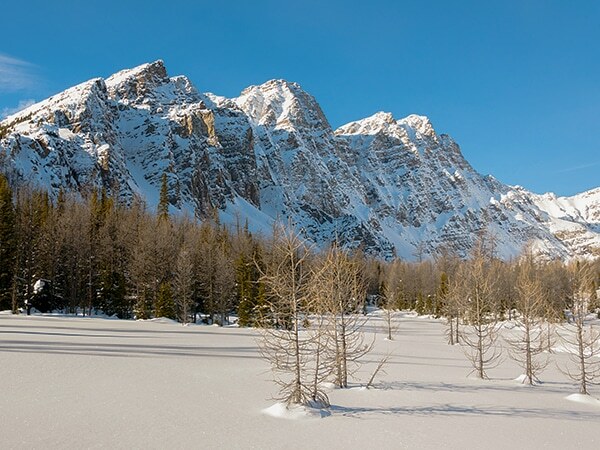 Paradise Valley is stunning in summer, but it is also a very good snowshoeing trail come winter. Located near Lake Louise, this trail is worth the effort in order to see the incredible mountain peaks that surround the valley. You will probably have the place to yourself midweek. 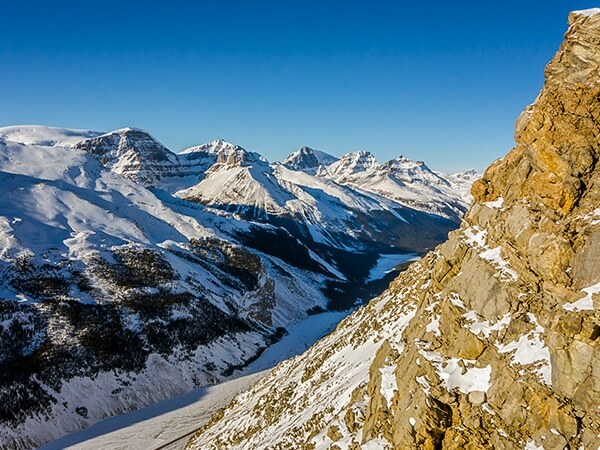 The Peyto Lake Viewpoint is one of the most spectacular viewpoints in the Canadian Rockies. In winter you can often hike to the first viewpoint, but snowshoes allow you to visit a second viewpoint. This is one of the classic winter trails in Banff National Park. Taylor Lake, at the foot of Mount Bell, is a great destination for snowshoeing in Banff National Park. Nearby Panorama Meadows should be the main draw though, as the views here are spectacular. 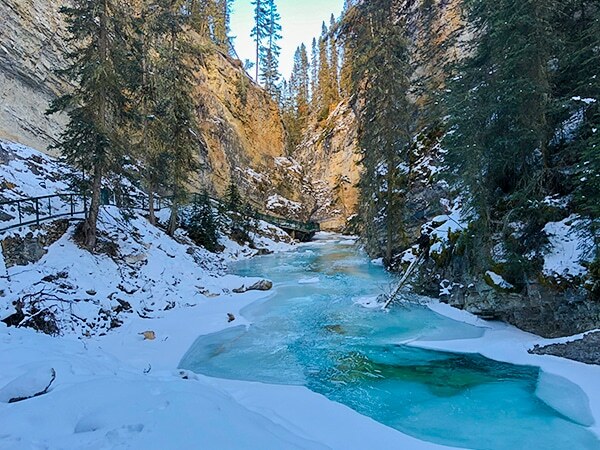 The ice in Johnston Canyon is the main reason this is one of the best snowshoe trails in Banff National Park. It’s not a long trail, but the scenery along the way make it worth the effort. You can usually do this trail with microspikes. 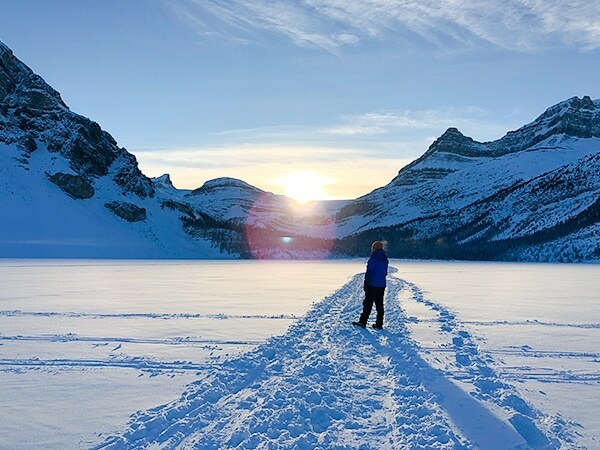 The best time to enjoy Bow Lake is mid-week in the winter, where you will be the only person there. 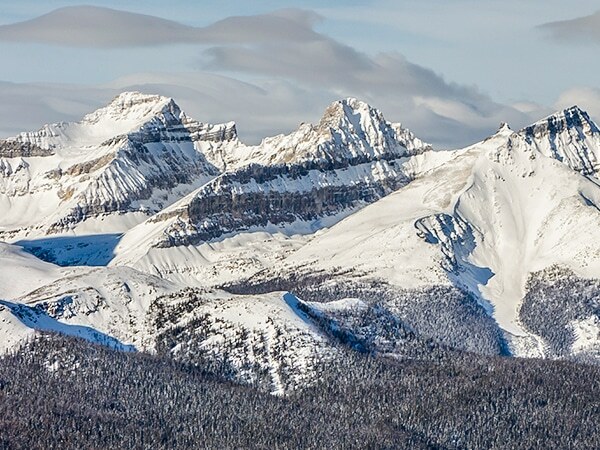 This is a great snowshoe trails in Banff National Park for beginners. 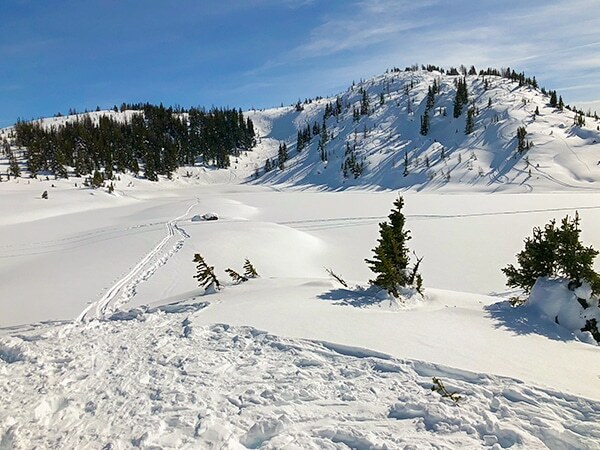 You get all of the magnificent scenery you could want on a short snowshoeing trail.